Strannik is exploring his new indoor exhibit. The Milwaukee County Zoo is pleased to announce the arrival of its recent acquisition, a male Amur tiger named Strannik, from the Toledo Zoo. He is now on public exhibit, and becoming acclimated to his new home. Strannik, a Russian word meaning “pilgrim,” arrived here with a recommendation to breed with Amba, one of the Zoo’s current females, and the mother to the Zoo’s last tiger litter born in 2009. He enjoys a diet of about 12.5 pounds of meat daily. Born in February 2003, at Utah’s Hogle Park Zoo, 13-year-old Strannik weighs approximately 400 pounds, and is in great body condition. Keepers at the Milwaukee County Zoo report they love working with him, and even though it took a bit of time for him to acclimate to his new keepers and surroundings, he’s now a “giant baby.” They’ve noticed his chuffing sounds directed at the Zoo’s female tigers. Chuffing is a non-threatening vocalization between cats to express a type of greeting or excitement. 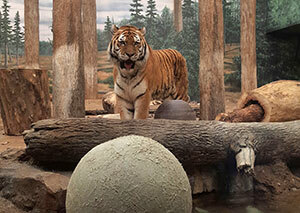 Visitors can see Strannik sporadically, either in the indoor or outdoor displays, as he will rotate exhibit time with the three female tigers. Keepers try to rotate animals through the areas during the day in order to offer new experiences, smells and interactions in both the indoor and outdoor exhibits. Animals can also spend time off exhibit which means they receive extra training from the keepers and new areas to explore.